CENTENNIAL, Colo. (AP) — James Holmes will spend the rest of his life in prison after at least one juror balked at the possibility of sentencing him to death for the massacre that claimed 12 lives and spawned a gut-wrenching four-month trial. Because the 12 jurors failed to unanimously agree that Holmes should be executed, he will be sentenced to life in prison without parole for the chilling 2012 attack on a midnight screening of a Batman movie that also left 70 injured. 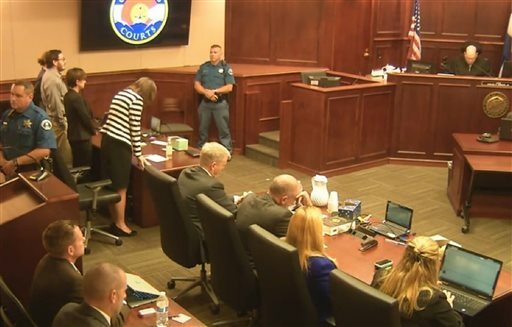 Nine jurors wanted to execute Holmes, but one was steadfastly opposed and two others wavering, a juror told reporters after the verdict was announced. The verdict shocked the courtroom. Holmes’ mother, Arlene, who had begged jurors to spare his life, leaned her head against her husband’s shoulder and began sobbing. 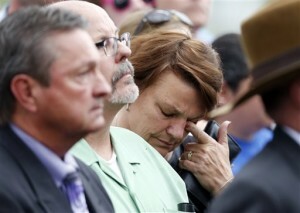 In the back, Aurora police officers who responded to the bloody scene of Holmes’ attacks began crying. 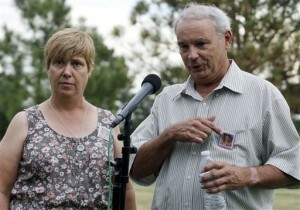 Sandy Phillips, whose daughter Jessica Ghawi was killed by Holmes, shook her head no and then held it in her hands. Ashley Moser, whose 6-year-old daughter, Veronica Moser-Sullivan, died in the attack and who was herself paralyzed by Holmes’ bullets, also shook her head and then slowly leaned it against the wheelchair of another paralyzed victim, Caleb Medley. Families of victims began to leave the courtroom as Judge Carlos Samour Jr. continued reading the verdict. Their wails were audible through the closed courtroom doors. As in previous proceedings, Holmes, who is on anti-psychotic medication that dulls his responses, showed no reaction. His attorneys left court without commenting. 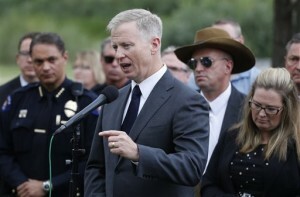 The verdict was also a setback for District Attorney George Brauchler, who two years ago rejected a plea deal from Holmes’ attorney that would have ended the case with life in prison, the same result. Brauchler said the defense refused to let Holmes be examined by a state psychiatrist or release a notebook in which he detailed his reasons for the attack. Holmes’ subsequent videotaped psychiatric exams were played at trial and the notebook entered into evidence. “Because of that decision,” Brauchler said, “the community now knows everything about this case.” Brauchler added that he was disappointed with the verdict, but he praised the jury for doing “a hell of a job” during the grueling, four-month trial. Defense attorneys argued Holmes’ schizophrenia led to a psychotic breakdown and powerful delusions drove him to carry out one of the nation’s deadliest mass shootings. Victims were devastated by the outcome. The verdict is the latest blow to the death penalty in Colorado, which has executed only one person since the U.S. Supreme Court reinstated the penalty in 1977. Gov. John Hickenlooper in 2013 said he would not carry out the scheduled execution of a man convicted of killing four at a Chuck E. Cheese in 1993. There was never any question during the trial as to whether Holmes was the killer. He meekly surrendered outside the theater, where police found him clad head-to-toe in combat gear. It took jurors only about 12 hours of deliberations to decide the first part — they rejected his insanity defense and found him guilty of 165 felony counts. The case could have ended the same way more than two years ago, when Holmes offered to plead guilty if he could avoid the death penalty. Prosecutors rejected the offer. The trial provided a rare look inside the mind of a mass shooter. Most are killed by police, kill themselves or plead guilty. By pleading insanity, he dropped his privacy rights and agreed to be examined by court-ordered psychiatrists. Holmes told one that he had been secretly obsessed with thoughts of killing since he was 10. His parents testified he seemed a normal, affectionate child who withdrew socially in adolescence and became fascinated with science but did not seem abnormal. Holmes studied neuroscience hoping to understand what was happening to his mind. But it was when he moved from San Diego to Colorado to attend graduate school that his meltdown accelerated. Holmes flunked out of his prestigious doctoral program at the University of Colorado and broke up with a fellow graduate student, the only girlfriend he’d ever had. He began to buy guns and thousands of rounds of ammunition and scouted out The Century 16 theater complex to learn which auditorium would offer the highest number of victims. He kept his mounting homicidal thoughts from a university psychiatrist, instead describing them in the notebook he mailed to her hours before the shooting. Shortly after midnight on July 20, 2012, he slipped into the premiere of “The Dark Knight Rises,” stood before the crowd of more than 400, threw gas canisters and opened fire with a shotgun, assault rifle and semi-automatic pistol. This is what happens when Adam West is no longer Batman. Hope everyday in jail is a living he’ll for Holmes. Hope the lone juror lives to regret her decision too. Agree. Hopefully he will serve his term sharing his time with some people who will remind him of his crime on a daily basis.